The DRY-UP™ Water Tunnel is an engineered channel system specifically designed to help relieve hydrostatic pressure around the basement footing. Notched grooves on both sides of the DRY-UP™ Water Tunnel allow for water to be collected from the footing and wall joint. The DRY-UP™ Water Tunnel’s unique bottomless design allows for water to flow through the DRY-UP™ Water Tunnel faster to keep water out of basements. This unrestricted design allows for a flow rate of up to 140 gallons of water per minute! The DRY-UP™ Water Tunnel is designed to sit on top of the footing. The DRY-UP™ Water Tunnel is surrounded by filter rock to further filter out sediment from under the floor. When properly installed, the DRY-UP™ Water Tunnel, because of its unique design, does not clog like so many other drainage systems that sit on the footing. The DRY-UP™ Water Tunnel is the most structurally sound “on top of the footing” drainage system available today. The DRY-UP™ Water Tunnel installed with the DRY-UP™ Dimple Board is the best choice for contractors to use for peace of mind knowing that the basement wall will not shear. The DRY-UP™ Water Tunnel’s design allows for maximum concrete to be poured back on top of the system once installed. The DRY-UP™ Dimple Board has dimples that touch the outer basement wall, which will fill with concrete when the floor is re-poured. By having concrete against the outer wall, you or your customer will not have to worry about the bottom core of the wall moving. This prevents any costly repairs for you and a potential lawsuit from a customer. The DRY-UP™ Water Tunnel drains into the DRY-UP™ Sump Pump System which also helps to safeguard against power outages and pump failures. 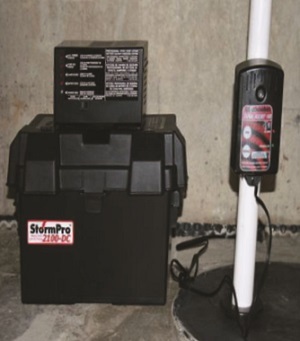 The DRY-UP™ Water Tunnel and the DRY-UP™ Sump Pump System work together to give home owners a safe, comfortable and dry basement. Wholesale pricing is available to basement waterproofing businesses and foundation repair contractors. Please CONTACT US for details on becoming a dealer. The DRY-UP™ Dimple Board is a highly engineered plastic membrane that drains all wall leaks into your new DRY-UP™ Water Tunnel system. The DRY-UP™ Dimple Board air gap technology increases the flow of wall drainage, weep hole drainage, and key way seepage to the DRY-UP™ Water Tunnel system, which helps to leave you with a clean dry basement. The dimpled design also allows the new concrete to flow all the way back to the wall. This helps to ensure that the bottom of the wall will not have any inward structural movement. 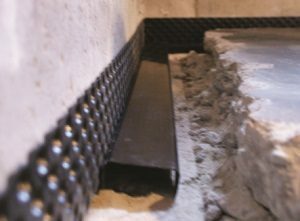 The DRY-UP™ Trench Drain is a line of defense in protecting basements from water infiltration. Outside drains can get clogged up with leaves or not keep up with heavy rains, causing water to flow in under the basement door. 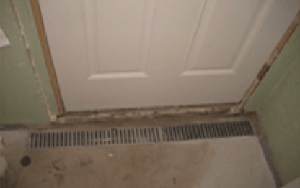 By installing a DRY-UP™ Trench Drain on the inside of a basement doorway, it will protect homes if water exceeds the outside drain capacity by safely draining away any water that enters in/around exterior basement doors.